I love Elizabeth Hoyt's books so I would have been reading this book anyway, but the trailer for the upcoming Scandalous Desires made me laugh! This makes me laugh every time I see it! And believe me, I have watched it quite a few times! 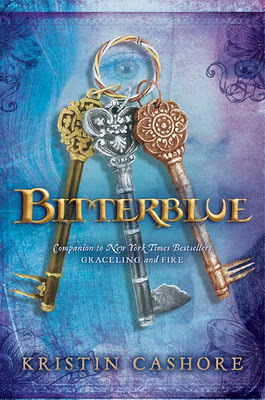 And in good news, we have a cover and a release date for Bitterblue by Kristin Cashore! The book comes out in May 2012 and I can't wait to read it! *This post is bought to you due to the fact that I am procrastinating instead of finishing the reading so that I can write my readalong post for The Lantern Readalong post. It will be up tomorrow instead! Whoops. That Hoyt trailer was too funny!! Thanks for sharing this trio of awesomeness with us today! Kailana, I know right! Can't wait to read it! Strlady, isn't it great when they get book trailers right! Sean, I ended up going on watching the whole thing again.... sigh. If you ever get over this way we can have a Vicar of Dibley Marathon. Oh its about time Bitterblue was on the release schedule - it seems like I've been waiting forever!